Hairspray can make you look good in more ways than one thanks to its many unexpected uses. In my years working in office settings and teller windows, I always kept a small bottle of hairspray at the ready. And it wasn’t for my hair, even during the lacquer-laden 1980s. Read on to learn the many different ways hairspray can come to the rescue for things other than hair emergencies. It just so happens that I am prone to getting ink on places it doesn’t belong, including clothes, purses, desktops, and the list goes on. Hairspray became my right-hand man. A few spritzes of this wonder mist will prevent ink from setting in, which means it can still be washed out and I haven’t ruined another outfit. Hairspray can even keep would-be stains in suspended animation until they can be properly cleaned on laundry day. But this isn’t the only miracle our sticky little friend can perform. Hairspray has several more tricks up its sleeves that you might not have expected. Keeping our four-legged friends off the furniture is no easy task. But keeping their fur off your couch and chairs can be. Hairspray can help keep your furniture free of pet hair. How? Simply spray some on a paper towel or rag and use it to clear upholstery of your best friend’s fur. Hairspray can also prolong that shiny new polish job on your dress shoes. A coat of hairspray after the final buff will protect the polish and keep it looking like new for much longer. Labels and price tags have their place, but when it’s time to remove them, sometimes they just won’t budge. Hairspray can convince that adhesive to give up and let go. Spritz a stubborn label with hairspray until it’s soaked. Let it sit for a minute or two, and then it should be easy to rub off. If you have a fly in the house that’s really getting on your last nerve, grab the hairspray. Give them a good shot of hairspray and it’s curtains for that bug! 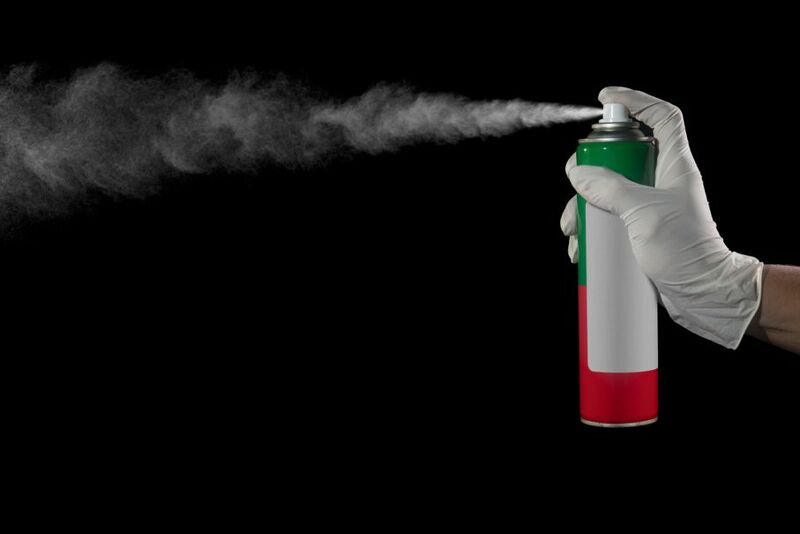 Using hairspray to dispatch uninvited insects is a lot safer than using pesticides, and it’s also a lot neater than using a fly swatter. Hairspray can also help preserve the clean-pressed look of new curtains and drapes. Before hanging new drapes or rehanging freshly cleaned ones, give them a coat of hairspray. Let it completely dry, and then spray on another coat. Repeat this process several times, letting the fabric dry completely in between each coat. This will keep your drapes and curtains looking clean longer by repelling dust and dirt. Static cling can really wreck your look, but that bottle of hairspray on your bathroom self can also be your new fashion assistant. Spritzing the underside of your garment with hairspray will dispatch the static so your clothes can hang as they should. Hairspray can be the crowning glory of your lovely new manicure. When the polish isn’t totally dry, it can become smeared and gashed. Giving your nails a finishing spritz of hairspray will promote the drying process and prevent chipping. Hairspray has made its way back into the laundry room. Not only will it take care of ink stains, it’s also the go-to guy for lipstick mishaps. Soak a lipstick stain with a few good hairspray spritzes and let it sit for 15 minutes. Then throw the stained article of clothing into the wash and those lip marks will be a thing of the past.